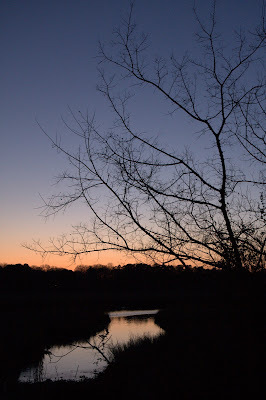 The Elizabeth River Nature and Canoe Trail at Carolanne Farms Neighborhood Park taken just after sunset. Once the site of a private sewage treatment plant, this beautiful piece of Virginia Beach, Virginia offers a secluded wooded dell, with glimpses of the Elizabeth River and surrounding marshes. Canon 40D, f/4.0, 1/250s, ISO 400, Canon 17-55mm f/2.8 zoom at 23mm.